Happy Monday! Thanks for being with us as we co-host for Make A Difference Monday, a place to get intentional about starting our week focused on the positive and dream up ways we can make a difference in the world. Today we're focusing on our NEW upcoming series that we'll be featuring during the weeks leading up to Easter. Growing up, my family never celebrated Lent. Friends would bemoan their lack of chocolate or Diet Coke, and I always wondered why. In my ignorance, Lent sounded more like a diet fad than a religious observance. For the uninitiated (like me! ), Lent is the roughly 40 days leading up to Easter in which some Christians pray and abstain from meat and other items. Different church denominations count days differently (some count Sundays, others don’t) and have different traditions about how to fast, what items to fast from, and when to fast. In the past two years, the three of us spent seven weeks fasting from certain items while praying for countries and causes that meant something to us (here's our first year and second year, if you'd like the details). This year, we want to shake things up a little. If you've joined with us during our annual Advent Acts of Kindness in the past, you know that we have a heart for fostering kindness and generosity for others, whether those affected are in our local communities or within the international community. So rather than trying to narrow down our focus to a few countries, this year, we've decided to specifically look at causes or concerns. We'll give you the details -- why each cause matters, and what you can do to help -- an idea for what we're giving up to remind us throughout the week, and practical ways you can help out with the cause, both locally and abroad. Here's the thing: It's easy to think about others at Christmas. We're consumed by gift-giving to others, wrapping gifts and dropping sweet notes in the mail. But what about the rest of the year? That's why this year for Lent, we want to replace self with service. Here's the plan: Beginning next week (Lent begins on Feb. 18, but for our purposes we'll start on the 16th) and continuing for the next seven weeks, we will focus on praying for one cause each week in the weeks leading up to Easter Sunday. As part of our weekly prayers, we will fast one item. Because we'll focus on different causes each week, you can join us here or on Facebook as your schedule and life allows -- but we hope you'll consider joining us for all seven weeks. Although we're going to be featuring some of the things near and dear to our hearts, the possibilities are endless. Involve your kids. And share your wonderful ideas with us! We’d love to hear them! Thank you for hosting and what a great list! So doable for any age. Thanks, Jenny! :) Glad you stopped by! This is a great idea! 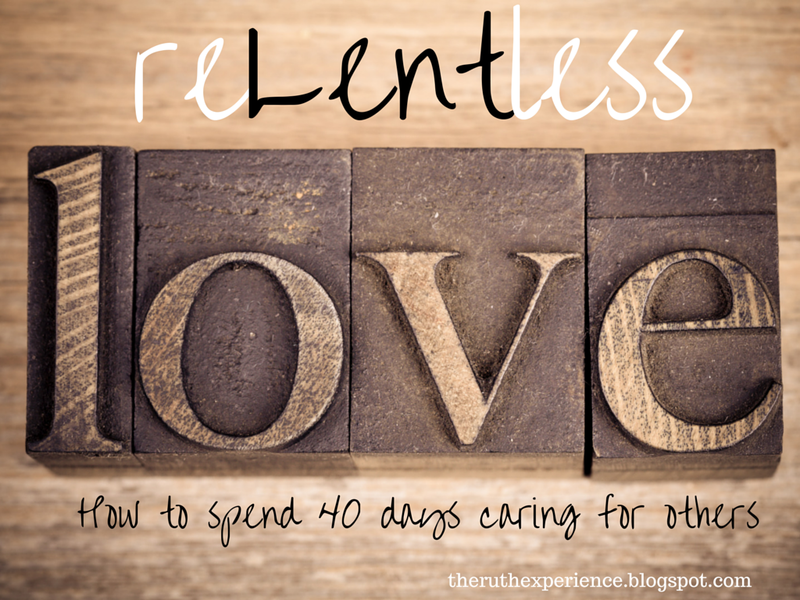 I didn't grow up celebrating Lent, either, but in the last decade we have employed the powerful study and practice in our home. Like Advent it prepares our heart for the power of the Holy Traditions which surround Easter celebrations, and the time spent devoted to God is always such a gift. Love the idea to pray each week for the different needs you have shared.